Now that my Itzik Zhelonek project is done, I'm idly looking for songs that haven't been recorded in a long time. This one (bought on eBay) is rendered in English on the outside of the sheet music as "Du Bist Mein Zun" and on the inside it says "Bist Main Zin" - isn't that annoying? Glenn Mehrbach played piano on this recording, thanks Glenn! I had no video footage so I decided to make this video with both the Yiddish transliteration and a LOOSE English translation. (The words are so dumb they do not deserve an exact rendition.) The verse (the part that comes first) is not so great but the chorus is wonderful. I probably shouldn't have sung the song this high! Oh well. Learn from my mistake and do better! 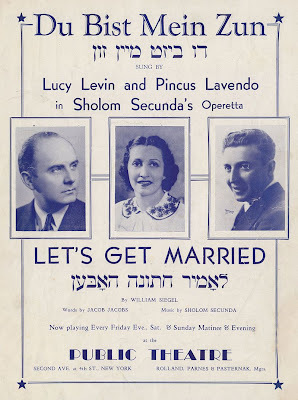 The operetta was "Let's Get Married," by William Siegel. I'm guessing that's Lucy Levin in the center, as Miriam the ingenue. Pincus Lavendo, whose recordings were featured in the Zhelonek books, is Benjamin, Miriam's boyfriend. Itzik Feld plays Izzie Foigel and Yetta Zwerling plays Tzirel, a niece. Pesach Burstein plays Louis, the boyfriend of Bessie the 'boarderke' (Diana Goldberg).